Mark Cavendish says he "cannot wait to compete with his childhood friends" at this summer's Commonwealth Games. The sprinter has been named in a 46-strong Manx team for the Glasgow Games and will contest the men's cycling road race alongside Peter Kennaugh. The 28-year-old said the idea of racing alongside old friends was "special". Cavendish ended the island's 20-year wait for a Commonwealth gold when he won the 20km scratch race at the Melbourne Games in 2006. Olympic gold medalist Peter Kennaugh, Delhi bronze medalist Mark Christian and seven-time Commonwealth Games veteran Andrew Roche will all be involved in a strong Manx road race team. In 2013 Cavendish won the British national championships on the Glasgow course which will be used this summer. He said: "Ultimately I compete for Great Britain at the Olympics and World Championships but to represent the Isle of Man and to go to a race with a group of friends that I have grown up with is a special thing. "It is something that I really enjoy and it is one of my favourite events in the sporting calendar." 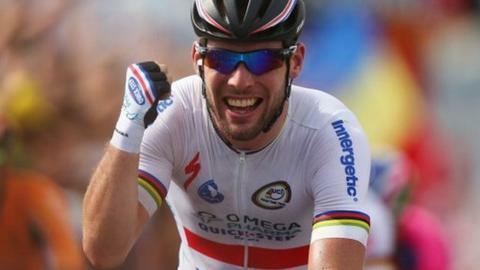 Cavendish, who has 25 stage wins in the Tour de France, has already competed at two Commonwealth Games - Melbourne six years ago and Delhi in 2010. He said: "My first was different. It was a big event - something I hadn't done before. "We were this little island, this little group from the Isle of Man and going to Australia to compete. "I was lucky enough to win gold. It was good because we were together as a group of friends when we got back to the village. "It was the same atmosphere in Delhi as well. "I remember racing against the Australian team, who were all professional, and saying to one of them they had better beat us because we've got a postman, an electrician and a guy from the water board in our team." The Commonwealth Games is the highest level at which a Manx sportsman or woman can represent the island. Athletes from the island will compete in nine of the 17 sports to feature in Glasgow.